Get real time expert guidance tailored to your varied business requirements and boost your customer satisfaction. We deliver outclass help desk call centre services to help you stand apart from your competitors. Our well qualified professionals use pre-defined procedures and call scripts to swiftly resolve all tech glitches faced by the users. Technical help desk outsourcing is the most preferred call centre outsourcing service sought by organizations across the globe to successfully transform their business processes. What is Technical Help Desk Outsourcing Support? Outsourcing technical support enables clients to provide quick assistance to its end users for a plethora of products, including computers, laptops, software, mobile phones, and other electronic gadgets. 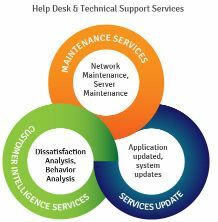 Go4Customer help desk outsourcing services are uniquely designed to improve overall end-user experience, address tech issues swiftly, minimize user downtime, and accelerate solution adoption all across the organization. Why Outsource Help Desk Services to Go4Customer? Our adept help desk technical support services are available for all size businesses. You can reach out to us through emails, calls, or by having online chat.